Turck offers a broad variety of molded Quick Disconnect Cables, Junction Boxes, and Receptacles. From our 5mm Pentafast connectors to the Power Fast with ratings up 40 amps. Standard offerings and custom assemblies to fit your connectivity requirements. N-Tron manufactures a broad family of Ethernet Switches designed specifically for industrial, marine, utility, and military users requiring high reliability, superior performance, and exceptional noise immunity. 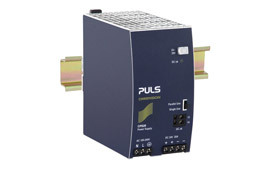 PULS manufactures the most technologically advanced din rail power supplies on the market. Efficient which equates to less heat in your panel and small foot print which equates to more space in your panel. DC Power supplies to 40 amp, DC UPS, DC to DC converters, and diode modules. Red Lion Control’s broad range of HMI products include display sizes from 3.5” to15”, but this isn’t your average pilot light push button replacement HMI. These puppies come out of the box with multiple comms ports capable of 100+ protocols, built in webserver, data logging capabilities, and expansion cards for even more comms ports including GSM modems. Don’t need a display? The Data Station Plus gives you the same functionality without the display. Banner’s impressive line up of LED lighting includes illumination for panels and work areas, vision lighting, stack lights, single point and array pick-to-light models, multi-color indicator lights with optional flashing and audible annunciators, traffic lights, and sunlight readable models. Automated Dynamics, Corp. (ADC) is a manufacturer’s representative of market leaders in factory and process automation products. Our territory includes the states of Texas, Oklahoma, Arkansas, Louisiana, Mississippi, and western Tennessee. The products we represent are available from a network of authorized stocking distributors throughout this area. Contact us to arrange a visit from one of our field sales engineers, for product or application assistance, or to locate a distributor nearest you. Request your copy of Banner Engineering’s newest LED Lighting and Indication Catalog. 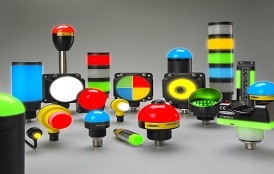 This catalog includes Work Area Lighting, Electrical Panel Lighting, Signal Tower Lights, Indicators, Touch Buttons, and Pick-to-Light Products. Click here and let us know in the comment field to send the 2015 L&I Catalog. 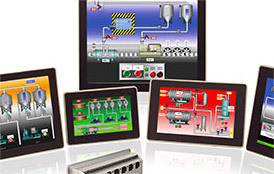 Red Lion Controls raises the bar for HMI’s with its New Graphite Series HMI’s. The Graphite series of advanced operator interface panels feature a rugged all cast-aluminum construction, a wide range of versatile plug-in modules, protocol conversion, data logging, and web based monitoring and control. Contact us to see this exciting new product or attend one of our Crimson Programming classes. 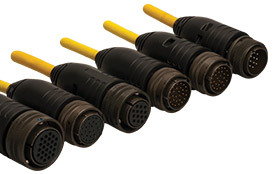 TURCK’s overmolded Mil-Spec connectors provide a full range of easy and quick connection for instrumentation and power applications. Overmolded Mil-Spec connectors diminish the risk of mis-wiring; allowing you to decrease downtime, use less manual labor on repairs, and save money. TURCK’s overmold design provides the flexibility to seal the connectors to a wide variety of different cable types. Contact us with your Mil-Spec needs or to speak with an application engineer. PULS introduces its newest addition to the Dimension C-series of Power Supplies. The CPS20.241 produces 24VDC at 20amps in a compact package that measures 65x124x127mm WxHxD. It has a power reserve of 20% included, which can be used continuously at temps up to 45C. AC Input 100-240V, DC output adjustable 24-28VDC, operating temp -25C to 70C. Approvals include ATEX Zone 2 and Class 1 Div2. Contact us for further information.